Vascotto recalled: “I did not make a good communication on one gybe and on that we lost one point that is important at the end of this day. The second one the plan was to go right and to start to windward. It was a good call and we had the start that we wanted, the speed was OK and so we had a quite good day. That first is important for us. “Both races were good. We went out with the objective of coming off the water with six points or less and we came off with four points. So from that regard we are pretty good. First race we had a pretty good race going with Rán Racing. We were able capitalise when they set a little too deep at the top mark first time and we rolled them. It was not a straightforward race. 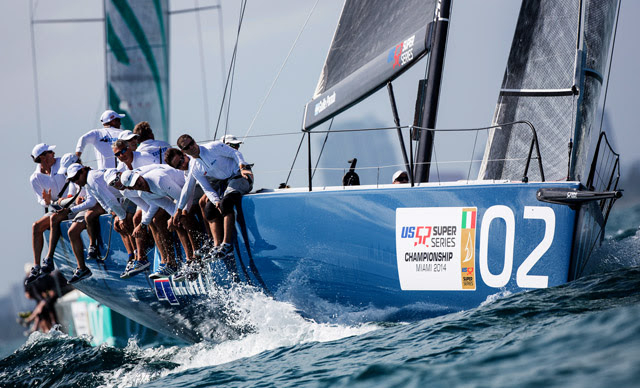 "Second race we executed a good start and going out to the right side in a big left hand shift and both boats – us and Azzurra – made nice gains on the group. It was then who beat who to the top mark. They tacked at a really good time for us to make a hard decision and we chose to get to the right hand side of them looking for a right hand shift which materialised but it went a little light and fluffy just for about 50 seconds with them to leeward of us and they might a nice gain. “The first one was tough and personally I made a mistake, I did not make a good communication on one gybe and on that we lost one point that is important at the end of this day. The second one the plan was to go right and to start to windward. It was a good call and we had the start that we wanted, the speed was OK and so we had a quite good day. That first is important for us. "Miami is an unpredictable place. You have to sail with what He gives you….and you need to make quick decisions as the conditions are always changing. "Usually I am good at that, but sometimes you make mistakes. You have to be patient when you have a bad result and try to save every point. That is the reason why I am a little disappointed in myself because I lost a point for not communicating when we were in a match against Interlodge. “It was not good for us in the first race, a lot better in the second. It is such close racing that is one thing doesn’t go your way you are in the pack, making extra tacks. 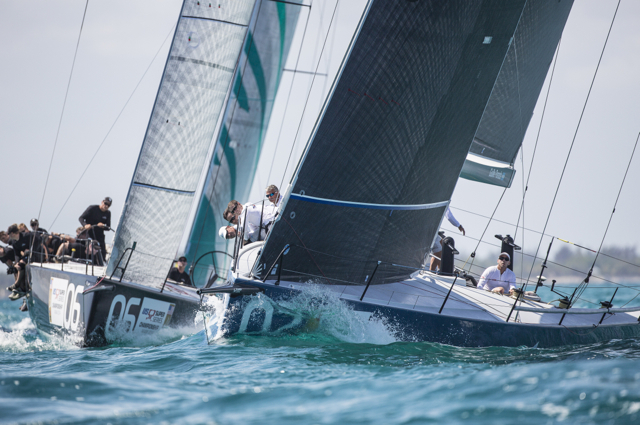 That was the story a bit in the first race, you are dipping a couple of boats and cant quite get your pace up. We struggled a little around some of the marks and then had a little rip in the chute and recovered pretty well. Jim did a pretty good job and it was a good day overall. 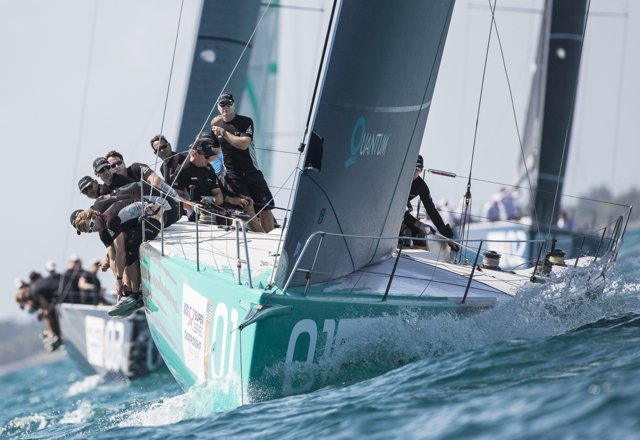 "We had nice pressure on the run in the second race and it just felt good. We just kept chipping away. Like all these series it is about trying to stay out of trouble and not have too many shockers. It is interesting because with all the changes it is like a new boat to the regular guys on board, and with all the changes with a new keel and rig, it is a learning curve how the boat feels and weight fore and aft. There is a lot to learn and a lot to gain.